WHAT IS A CERTIFICATE OF RECOGNITION (COR)? 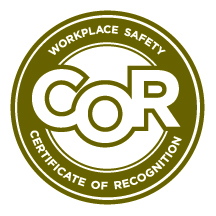 A Certificate of Recognition (COR) is awarded to employers who develop and maintain a health and safety management program that meet or exceed established standards as required in the Partnerships for Injury Reduction Program or as commonly referred to as PIR. A COR shows that the employer’s health and safety management program has been evaluated by a certified auditor and meets or exceeds the established provincial standards. These standards are established by Occupational Health and Safety (OHS) under the Partnerships for Injury Reduction Program (PIR). To get a COR, your business must first have a health and safety management program in place, and then have it successfully audited through a Certifying Partner. The Certifying Partner for the hospitality industry is the Alberta Hospitality Safety Association (AHSA). Once you have a health and safety management program in place, you’ll need to have the program audited to ensure it meets or exceeds the established standards. Contact your AHSA for a list of qualified auditors and to discuss all the audit requirements. Auditors should submit the completed audit report and instrument to their AHSA for quality assurance review within 14 days after completion of data gathering activities. All completed Audits reports must be submitted within 21 days of completion of data gathering activities. The audit will determine how well your health and safety management program is working, and if it complies with AHSA’s standards. Once the auditor has completed the audit, they will send a written report to AHSA for a quality assurance review. In order to pass the audit, you must score at least 80% overall, with a minimum score of 50% in each of the audit elements. If it passes, AHSA will send a request to the Government of Alberta to issue a COR. The certificate is signed by both the government and AHSA, and sent to you for your records. A COR is valid for 3 years from the date of issue, if all maintenance requirements are met. To maintain a COR, you must do a maintenance audit in each of the 2 calendar years after your certification audit. Maintenance audits must be done by a qualified auditor, recognized by AHSA. The auditor can be internal to the organization, or external. Maintenance audits must achieve at least 60% overall for the audit to be accepted for COR maintenance purposes. A COR is must be renewed every three years, prior to reaching the expiry date. The criteria for renewing a COR are the same as for issuing a COR. You must get an audit score of at least 80% overall, and a minimum score of 50% in all the audit elements. Members of AHSA, who hold a valid COR, have an opportunity to contract an AHSA certified auditor or have internal staff trained and certified as an AHSA auditor in order to participate Peer Audit Program.